"That drive was 7 hours? Really? That only felt like one! We were having so much fun." No word of a lie, these words were spoken. This was said on the very last day of our 17-day road trip. By this point, we had spent over 51 hours in the car driving out to the East Coast and back (with stops along the way, of course!). 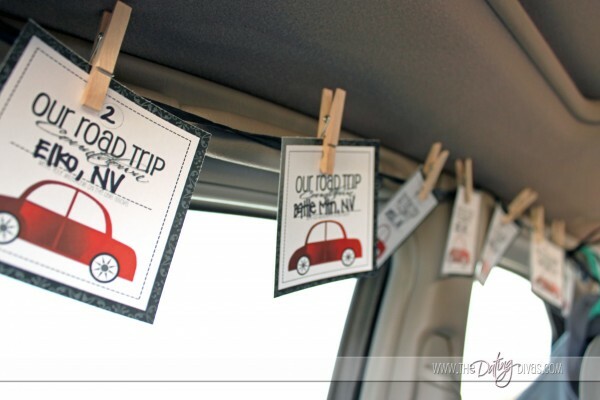 We learned a thing or two about how to pass the time well - especially road trip activities for kids..
After you assemble your activities, don't let the kids have access to everything all at once. Like Christmas morning, all the fun will overwhelm them and they will burn through each activity way too quickly. We held back a special activity for each of the longest days (pulled out conveniently when needed i.e. grumpy times). This takes discipline and the ability to hide some of the fun materials out of sight until required, but it's so worth it. 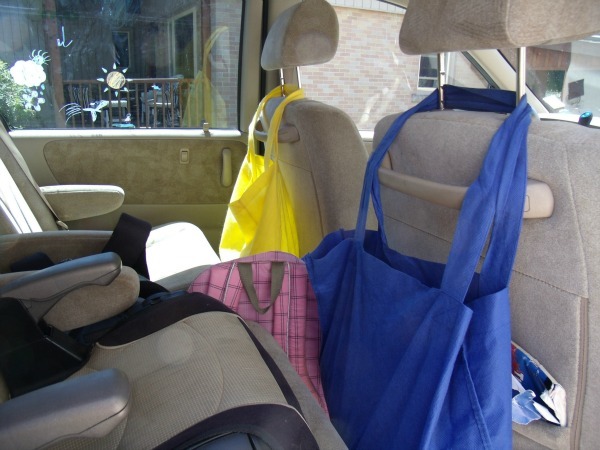 Robin concocted this one and the kids faces lit up when they buckled in on day 1 of the drive: their own special activity bags hanging behind the parent seats for easy-kid access. 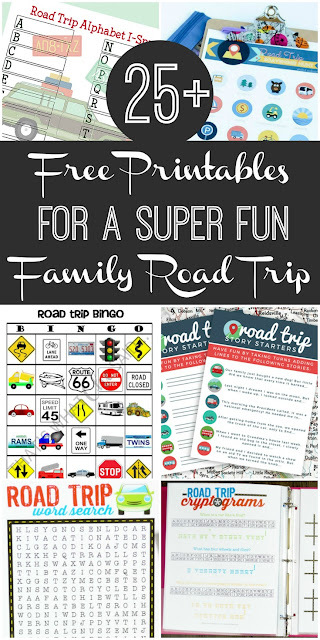 We created a great list of truly fun family road trip games and activities - all from Amazon - one cart and you're done! Check it out here. Also, next to them, we packed their backpacks filled with books, stickers and other fun stuff. We scored ours from our favourite book deals site: Book Outlet. A good sticker book can amuse for hours. Look especially for the ones that are re-positionable. An age-appropriate reader or two, just be sure to watch for queasy tummies, which happens to our daughter (and Robin) when reading in the car. Madlibs are a hilarious way to pass the time, and learn grammar together. Our 6-year old son learned on this trip that he needed to give us way more heads up than "about to burst" when he needed a stop. After the first couple near accidents, we coached him regularly to "check in with himself to see if he needed to go". He is bad at getting distracted with what he is doing and ignoring his body until the last possible second. So, if you've got a kid like this, ask often! We were able to expand his threshold for waiting from 1 minute to 10 minutes by the end of the trip - which we call a victory. It still required an emergency stop outside of a toll booth in Batavia NY where he just couldn't hold it. By the way: is it illegal for a small boy to pee on his own parents van? Because we had to do that - right next to a New York State Trooper. Robin chose this game to pass the time and learn more about geography together. It ended up getting all of us interested in watching the vehicles rolling past and we played right up until we got home. 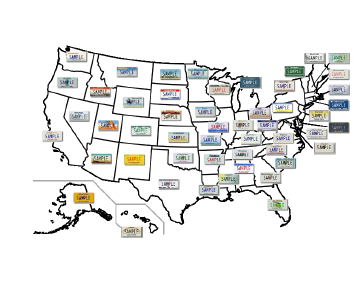 We saw 36 US states and 8 provinces. Visit Printable Paper to use the same one we did. Technology does make long trips a whole lot easier. We collected the following for our trip: Nintendo DSi, hand-me-down iPod Touch, our second-hand iPad and a borrowed iPad. Best bang for your buck? Likely the iPod touch with cheap ($.99) games like Angry Birds and Cut the Rope that you can buy once and transfer to multiple devices (including the iPad). The iPod also held some backup movies, audiobooks and music. The kids do like the Nintendo DSi and the built-in software for sound recording, taking pictures and creating animations got more workout than all their other purchased games combined. Ed was all proud that he actually remembered to plug the portable DVD player adapter into the back power jack in our van before we left the house. It was basically unnecessary, as the kids pretty much ignored the DVD player, other than 1 movie on the first day and a few sporadic TV show episodes once and awhile. Nice for the variety, but not a lifesaver. It has been great in the past, but they just weren't into it this time. This was our first family trip where we used audio books. We now highly recommended them. There were long stretches of our drive were we all sat listening quietly and letting the miles slip by unnoticed. We gave two audio book sources a try - both free. First our local library, which came through with some Harry Potter and Percy Jackson - both time limited (like any library loan), so it came with some pressure to finish. We also signed up for a free trial at Audible which came with a credit for 2 books. A classic series from Ed's Childhood "Bunnicula " proved the right pace. 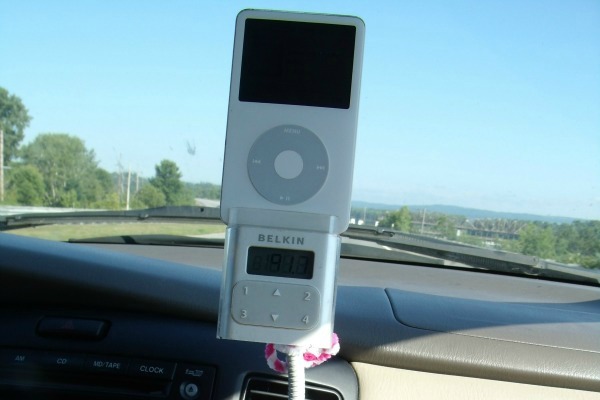 If you don't have an FM transmitter for your current MP3 Player, you may be able to hack it. Ed bought ours 5 years ago for $10 (right after Apple stopped making iPods that fit it). He cut a couple bits of plastic out of the side holder with a hacksaw. It has fit every iPod model made since then. There are many cheaper models out there - don't get suckered by the $90 Monster or Dre. Beats or whatever model. And while we are talking audio: don't forget the Fade button on your car speakers. When the kids were occupied in the back, we'd listen to grown-up music up front. 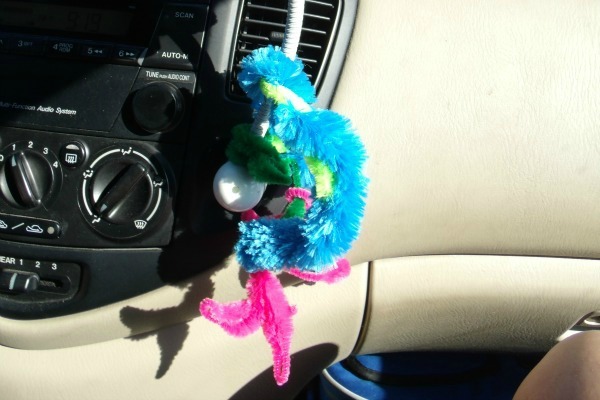 Or Fade the kids music to the back and have a real conversation up front. We had this activity planned for our trip but didn't actually need it. (Robin still has all the close pins rolling around in her purse.) It's a fun idea to measure the milestones of your journey together. It might be helpful for your trip, visit The Dating Divas to download this and other printables. If possible, let a ferry take you part of the way. This was a great way to break up the drive. We didn't need to drive constantly, we were able to stretch our legs, eat some ice cream and breathe some non-recirculated air. Not always possible for all road trips, but if you have the option, take it. I know many of you will have competitive kids who can compete and have winners and losers and no one will cry and/or get furious. It must be nice. You should enjoy that. We, on the other hand, have learned co-operative games work better. 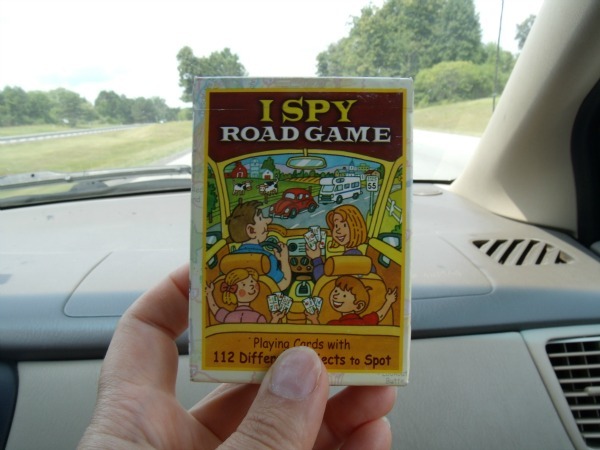 For this, I Spy Road Game we play it co-cooperatively: Let's see how quickly we can find all the things on these cards. Time yourselves. If you have a competitive game you plan on using, invent a co-op version and keep it stored in your memory for when all hell breaks loose. Even the most rational kid gets testy after several hours on lockdown. This is a flower and a rhino horn - you can see that right? As malleable as play dough without the mess. Robin tore off and handed back sheets as needed (to avoid kids cutting themselves). We found scotch tape came in handy for the more complicated creations. These Window Markers were the hands down favorite activity on the trip. As we publish this post, we are heading to visit Ed's folks. A five-hour drive. Not intimidating in the slightest anymore. Great ideas. We just did a road trip from PA to WY and did some of these things. I'm pinning this for any future road trips. Yea, ours went so well, we think we'll take the kids on another road trip (maybe as early as next summer). Thanks for sharing! Thanks fro sharing your comment, Christa! It opens up so much family fun when your drives go well, doesn't it? We're planning future trips too! Robin - Thank, thank, thank you for this post!! I've got a 12 hour trip planned in three weeks, and like others, am in search of any and all successful ideas! Many of your ideas were new to me, but I especially loved your last one: Window Markers. Are these a special kind of marker or will dry erase markers work? Dry erase markers WILL work. We do it all the time on our windows. Also works on mirrors. Wipes off just as easy as dry erase, no special wipe or cleanser needed. For that matter, Washable markers WILL work as well, but you will need wipes or least napkins and water to clean them, it's easy. This is compared to dry erase markers (which you can wipe with your dry hand). It requires as much effort/pressure to clean as normal window cleaning. Permanent markers will work as well, but I don't recommend it. It is not easy to "clean fast", and the smell would not be any fun. This is from personal experience by the way :) I don't work for a marker company. Haha. If I had a marker company I'd totally hire you! Thanks for sharing all those great tips! 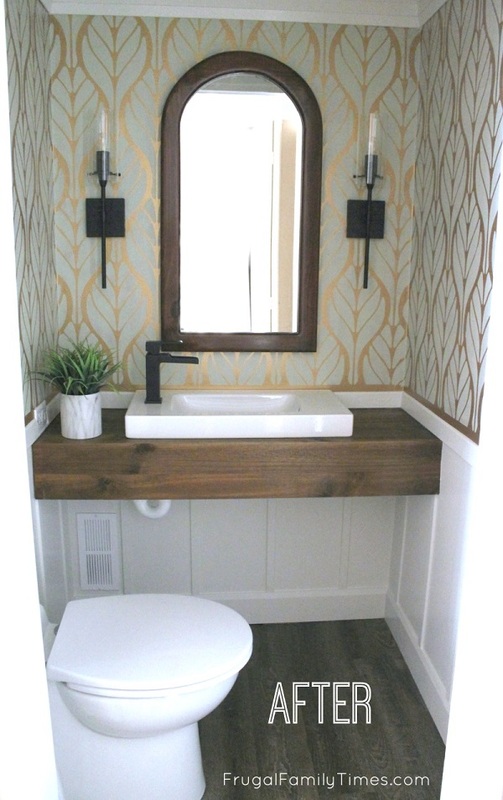 Even if you don't have toddlers, a travel potty can be really handy for those "we just past the last bathroom and my child has to go now" type situations. We have one that folds up for storage, can be a child's ring seat on an adult potty, or a small stand alone potty by itself. It's fabulous for my 3 year old! I think it's important to mention comfortable clothes for the littles too. My mother always made sure we were in elastic waists for our 8+ hour car trips. And healthy snacks to munch on along the way. Great ideas, Katelyn! I'm with you on the comfortable clothes - and not just for the kids - yoga pants all the way. :) We have planned another post with healthier travel snacks. Thanks for your comment! Great clever tips for any mom. 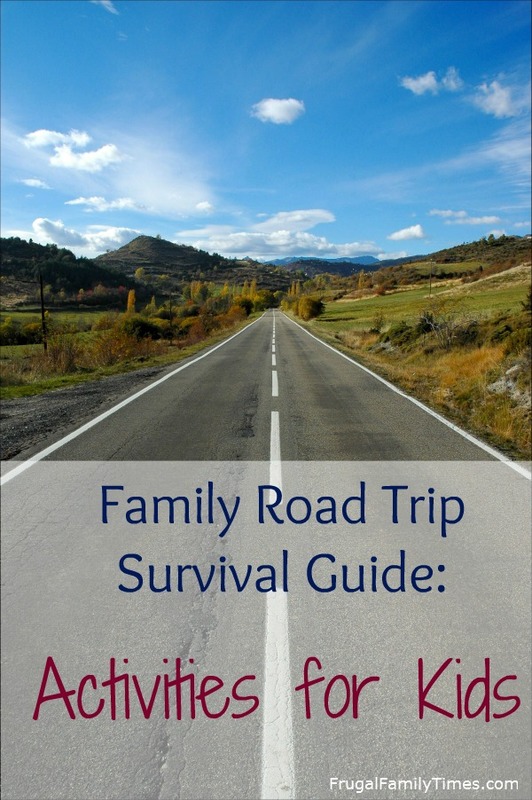 Traveling with kids can be difficult, but it could also be the family experience for lifetime. What a great post–definitely chock full of helpful tips. Pinning this so that I can reference it in a few months–we take lots of small road trips now with our son, but we have a big one planned and by then will have added another little one to the family! Hey buddy, I've got a 22 hour trip planned in four weeks, and like others, am in search of any and all successful ideas! Many of your ideas were new to me, but I especially loved your last one: Window Markers. These are some really nice tips that you have mentioned or a mommy. Family trips are great for sure. Travelling with children can be a bit like taking a herd of wild goats on holiday. Whether they’re your own or someone else’s, factoring a child’s needs into your travels involves a lot more than sticking on a CD full of pop music and making toilet stops. The greatest thing you can take – whether at the airport, sightseeing or getting from A to B – is extra time. Toddlers love to explore and don’t care for the time pressures of travel, so you’re more likely to all retain your cool if you factor the faffing, gawping, stalling, toilet stops and tantrums into your time frame. Man with Van New Barnet Ltd.
Bring along back-up items, like extra crayons and coloring books, and make sure your child can carry his own backpack. The last thing you want is to fill each backpack to the top and then have to carry them all yourself. Amazing post! Always look for rest stops so that kids get chance to get out of the car and run around and eatables are most inportant while traveling with kids. I'm going to take a long trip with my noisy kids. So this article is really useful for me. Thanks for sharing it. Great. My family will need this post for our trip next week. Thank you. 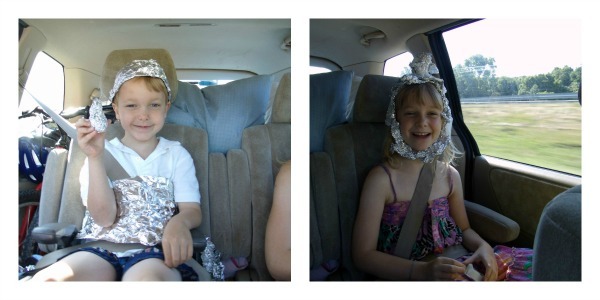 My kids really love listening to audio books during long trips. It's the best way to keep them be quiet. Thanks for this post. My kids can't stay still when they are on the car, that's a big matter because it's harder for me to drive the car safely. Fortunately I read your post I'll try these recommended ways, hope it will work with my kids. Thanks so much! My family with no children but my uncle’s is so messy with 3 girls and 1 boy that makes their trips so noisy every time they travel. Although they bring with them their toys and their necessary stuff, it seems not enough. They often argue and have a fight. Maybe I will suggest him one of your ideas. Very grateful for your tips. Planned to travel around Europe with my two sons. Can you suggest how to combine their school lessons and this trip ?